An otter was caught gleefully sliding in the snow by a photographer. Barrett Hedges, who runs BearHead Photography, filmed the wild River Otter larking around on a frozen river in Yellowstone National Park in Wyoming, USA. 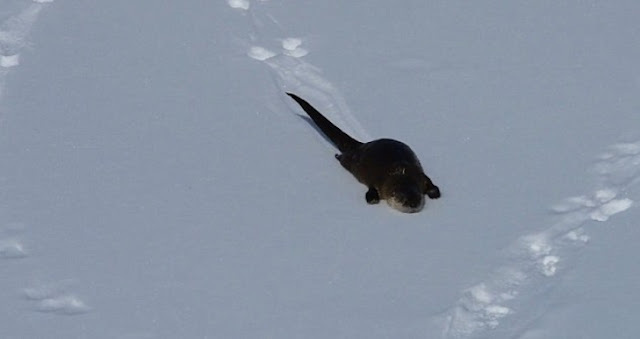 The playful animal was seen running, belly flopping into the snow and skidding along the surface on January 31. Posting on the BearHead Photography Facebook page, Mr Hedges wrote: 'River otters are some of the most fun wild animals to watch! There are 13 different species of Otters found in the world. There is evidence that they have been around for more than 5 million years. Most Otters are very social and the have a great time with each other. They are quite playful so people tend to want to observe them. Some of the common activities include climbing up hills and sliding down them as well as wrestling with each other. They also can create tools from items in their environment that they play with and that they use for protection. Responses to "Playful otter slides down a snowy hill at Yellowstone Park "